On August 13, just like any other day had to rush for a media meet and booked Uber. As usual, called the driver to inform my drop and pick up location but for some reason, he canceled the trip and I got a call from Uber. But this time, it was a female voice and I thought some customer care representative was calling to inform me about the cancelation. To my surprise, came to know that a woman driver is going to pick me up. So I asked her, "Hello mam..are you the first woman driver in Chennai? And as expected, I got an affirmative answer. I was very confident because being a regular Uber commuter, I never traveled in a vehicle driven by a woman driver. So I asked Jerinabegam about her driving experience, "I have been in the driving business for twelve years", she said. I asked her why she chose this profession, "Ellam Kudumba soolnizhai dhaan". Jerinabhegam told me that her husband had gone missing long back and she actually started her journey as a beggar in the streets to feed her kids (two girl children and one boy). I was shocked, she said that a good man gave her a good sum of money and asked move to a hut. He actually advised her not to be a beggar for the better future for her kids. Later, Jerina started working as a maid in nearby houses. "Being an young woman, those awkward eyes and looks made me uncomfortable so I stopped working as maid. After a few days, I started working as a cleaner in wedding halls but I wanted a respectable job. Right from my childhood, I had the passion to be an auto driver ", said Jerinabegam. So a few kind-hearted people gave her money to join in driving school and her first job is to load vegetables in Tata Ace (A mini truck which they call as Kutti Yaanai). Someone actually told Jerinabegam about FastTrack and then, she went to the office to enroll herself. "I used to earn well in FastTrack that we moved to a livable place and also provided basic education to my Kids". Jerina says that a customer from FastTrack actually provided book, uniform and tuition fee for her two girl children. But they didn't get the fee for a year and when Jerina called, she came to know that the kind man is no more. Even before FastTrack, Jerina worked a personal driver to a family. "They actually wanted me to come along with them to Bengaluru but told them that Chennai is my place. If I move out of my native, my neighbors would say that I'm earning money only in wrong way, enna solringa sir. Apdi dhaana pesuvanga? " and I nodded. Jerina says that after FastTrack passed a rule that only drivers who have own vehicle alone should work for them, she lost the job." It was a tough time, I don't know what to do. Then, came Uber ", she said. Before joining Uber, Jerina once again had to work as a maid. "I'm earning 10k to 18k per month sir. With this income, my family is having one good meal per day. I start my work early in the morning and sometimes reached home in wee hours (2 am). My kids take care of themselves. I generally have my breakfast at home, during work, I would have biscuits and water. What to do sir? Work irukkula", she smiled. Jerina was actually interviewed by a private TV network saying when she drove Tata Ace saying that they would help her "But Ethum Nadakla sir'. However, through Dinamalar web channel, Jerina got around 60k fund which helped for the education of her kids. I actually asked Jerina if she ever wants an own vehicle, she smiled and said "Loan lam kashtam sir". Before stepping out of the vehicle, I asked"Oru photo eduthukalama ungala. You are an inspiring woman, I work in the media. Though I can't promise anything, will write about you and let's see if someone come forward to help", she said "yes". Though I immediately posted about Jerinabegam on Twitter, FB, and Instagram, didn't explain about her story in detail. 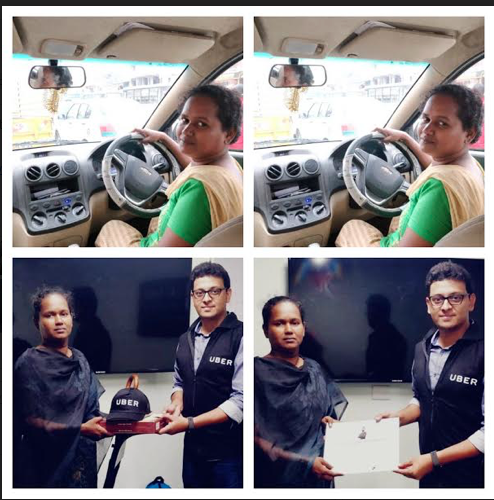 I only wrote "Meet Jerinabegam, Chennai's first @Uber_Chennai woman driver. Her story is very inspiring, will write about it soon. Being a single parent, she has done all kinds of work for her three children. While we feel insecure for small setbacks in life, she has come a long way #Inspiration" but Uber quickly responded and actually honored Jerina (Pictures attached). 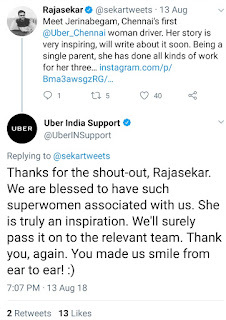 On August 13, Uber India responded to my tweet "Thanks for the shout-out, Rajasekar. 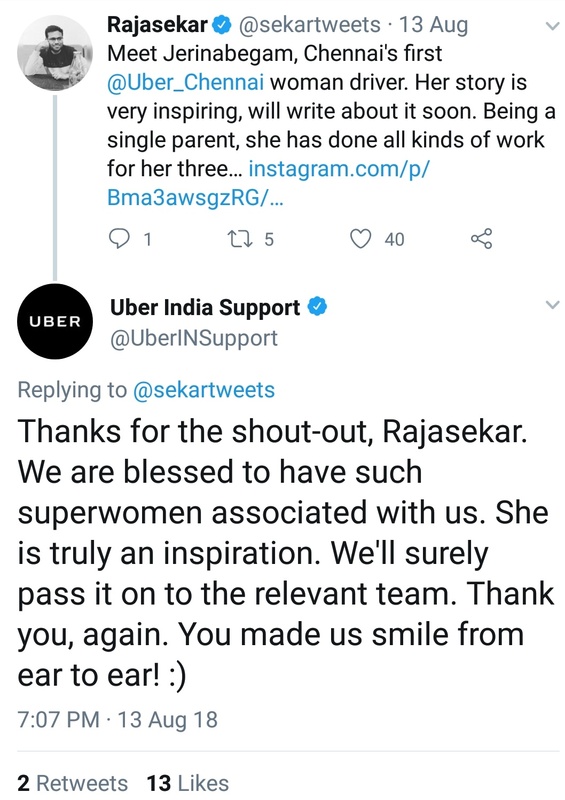 We are blessed to have such superwomen associated with us. She is truly an inspiration. We'll surely pass it on to the relevant team. Thank you, again. You made us smile from ear to ear! :)". Later, I posted "Hope you guys give opportunities to more such super women across India :)". 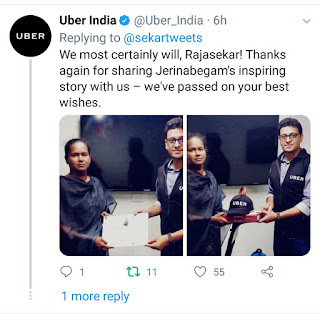 Now after one week, Uber actually honored Jerinabegam at their office. Posting the special pics from Uber office, they wrote "We most certainly will, Rajasekar! Thanks again for sharing Jerinabegam's inspiring story with us – we've passed on your best wishes". It's an amazing feeling to bring the smile on the face of inspiring, hard-working people like Jerinabegam and I also came to know that social media is a powerful tool that one can also use for a good cause. My friends in the media are also asking for Jerinabegam's number so that they can interview her. Hope Jerina gets the much-needed help. To contact Jerinabegam, call her son Alim - 86080 12909. Jerina also has her own mobile but she feels any call coming through her son would be risk-free.